The AWS Injector module easily connects any tag data from the Ignition into the Amazon Web Services (AWS) cloud infrastructure. With a simple configuration, tag data will flow into the AWS Kinesis Streams or DynamoDB using an easy to read JSON representation to take full advantage of AWS and all the benefits it offers. 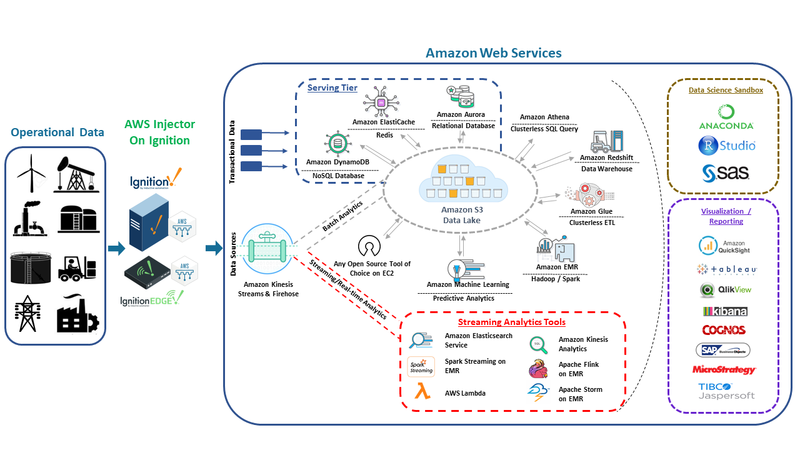 The diagram below shows how using the AWS Injector Module connects OT data into the AWS Web Services. Data is streamed into AWS Kinesis for real-time, streaming or batch analytics.